Welcome to CanPlay Casino Rewards Program. As a member of our loyalty program, you’ll have the opportunity to earn exclusive rewards and bonuses every time you play at CanPlayCasino.com. Membership is automatic with no enrollment needed. Every real money wager you make will earn both Status Points (SP) and Reward Points (RP). Status Points are used to increase your Loyalty Level and Reward Points can be redeemed to purchase cash in the points store. At CanPlayCasino.com, we roll out the red carpet for our high rollers! Our players deserve the best, we want to spoil them with all the benefits of being a part of our VIP program. Status Points earned during each calendar month determine your Loyalty Level. You automatically earn points from playing in real money games. Your points earned from these real money games are called ‘Status Points’ (SP). As you earn SP you also earn ‘Reward Points’, (RP). Reward Points can be spent to buy rewards in our Points Store. 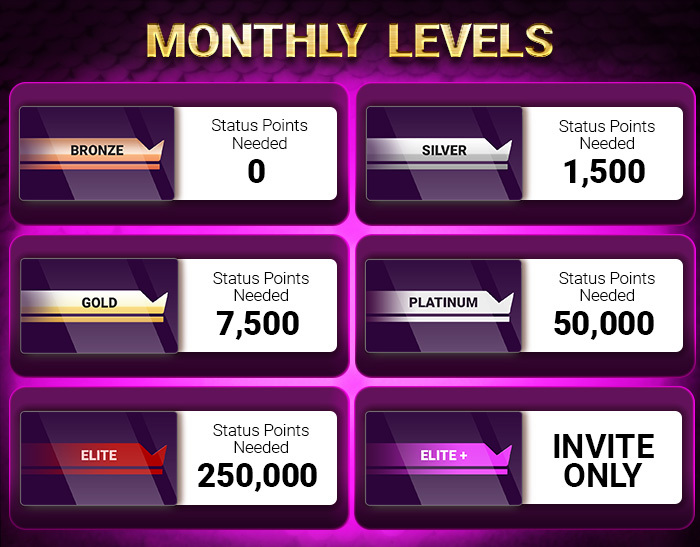 The amount of RP you have earned will be displayed in the Points Store. Bonuses will be granted automatically. Bonuses carry a 1x playthrough and expire within 30 days of issuance.